Citation: C N Trueman "Ulrich Zwingli"
Ulrich Zwingli was a Swiss Protestant leader in the Reformation. Ulrich Zwingli is not as famous as the likes as Martin Luther or John Calvin but he did play his part in the break with the Roman Catholic Church. Ulrich (sometimes spelt Huldreich) Zwingli was born in 1484. He attended universities at Basle and Vienna and served as a parish priest in Glarus, Switzerland. Zwingli went with soldiers from Glarus to fight in the Habsburg-Valois Wars and between 1516 and 1518 he started to question the whole issue of Catholicism as Humanism started to make an impression on him. It is possible that Zwingli did not read any Lutheran literature until he moved in 1518 to Zurich as a Common Preacher (Leutpriester) at the Great Minster. It was at the Great Minster that Zwingli stated what is called the Zurich Reformation with sermons that were based on the Bible. Zwingli soon converted the city’s council to his points of view. The council pushed the city into becoming a stronghold of Protestantism and Zurich’s lead was followed by Berne and Basle. Zwingli’s ‘67 Articles’ were adopted by Zurich as the city’s official doctrine and the city experienced rapid reform. Preaching and Bible readings – known as prophesyings – were made more frequent; images and relics were frowned on, clerical marriage was allowed, monks and nuns were encouraged to come out of their isolated existence, monasteries were dissolved and their wealth was used to fund education and poor relief. In 1525, Zurich broke with Rome and the Mass became a very simple ceremony using both bread and blood which merely represented the body and blood of Christ. The church of Zwingli attempted to control moral behaviour and strict supervision became common in Zurich. As with Martin Luther and John Calvin, the problem Zwingli faced was that some people were concerned that he had gone too far too soon while others, especially the Anabaptists, felt that he had not gone far enough. 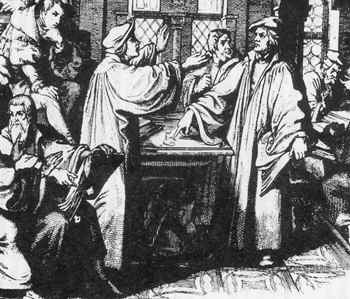 The Anabaptists were dealt with when Zwingli fell in with the city’s magistrates and supported the move to exile the Anabaptists or if they refused to leave the city, deal with them in another way – drowning. Zwingli and Luther met at Marburg in 1529 in an attempt to unite the Protestant faiths. This meeting failed to do this. Both men could not reach an agreement on what Christ said at the Last Supper. Luther believed that ‘this is my body’ meant just that whereas Zwingli believed that ‘my’ meant signifies. Such disunity among the Protestant faiths only served to encourage the Catholic Church that the Counter-Reformation was having an impact. Though Zurich became a stronghold of Protestantism, the areas surrounding the city remained wary of a resurgent Catholic Church. They also feared that Zurich might become too powerful and assert its city powers within these regions. Also the area around Zurich was famed for the mercenaries it provided and such a ‘profession’ was frowned on by Zwingli. In 1529, these areas around Zurich formed the Christian Union and joined with the catholic Austrian monarchy. Zwingli preached a religious war against them and two campaigns were launched in 1529 and 1531. Zwingli was killed at the Battle of Keppel in October 1531. His work was continued by his son-in-law, Heinrich Bullinger.